The great Mike Dikk from Kissing Contest emailed me about the Black Devil Doll from Hell single on Poisoned Mind Records. It launched a serious record nerd back and forth and our latest soundtrack podcast. I had never heard of this crazy movie, director or soundtrack. Travis from Buckflix ordered me a copy, we got Darren to think about some soundtracks from his collection and were schooled by Travis and barely covered a millionth of the massive soundtrack world and our finds. 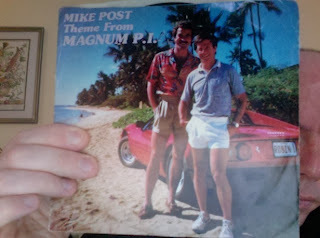 Travis has a Magnum PI seven inch.